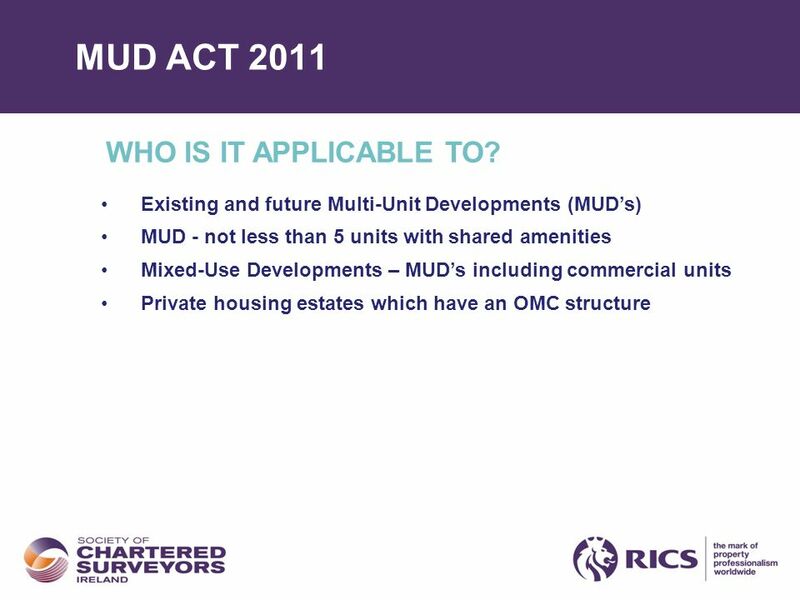 MULTI-UNIT DEVELOPMENTS (MUD) ACT 2011 AN OVERVIEW. 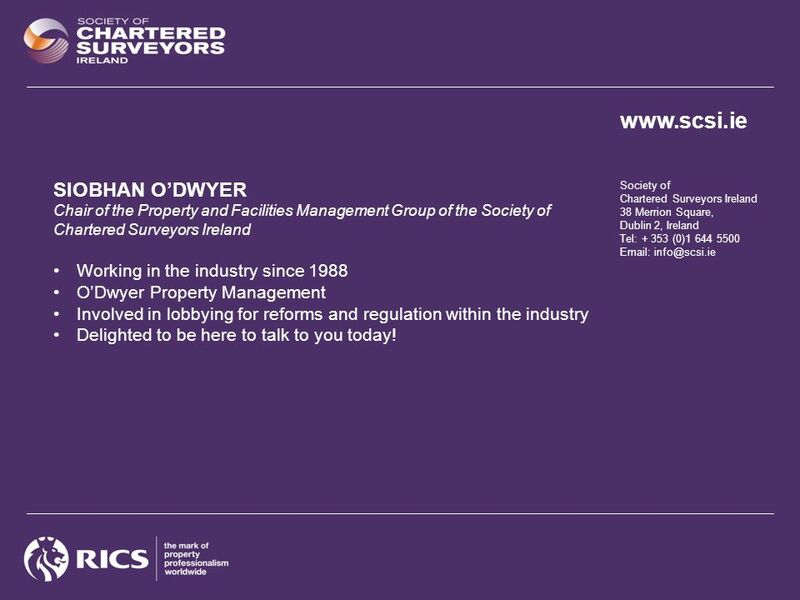 2 www.scsi.ie Society of Chartered Surveyors Ireland 38 Merrion Square, Dublin 2, Ireland Tel: + 353 (0)1 644 5500 Email: info@scsi.ie SIOBHAN ODWYER Chair of the Property and Facilities Management Group of the Society of Chartered Surveyors Ireland Working in the industry since 1988 ODwyer Property Management Involved in lobbying for reforms and regulation within the industry Delighted to be here to talk to you today! 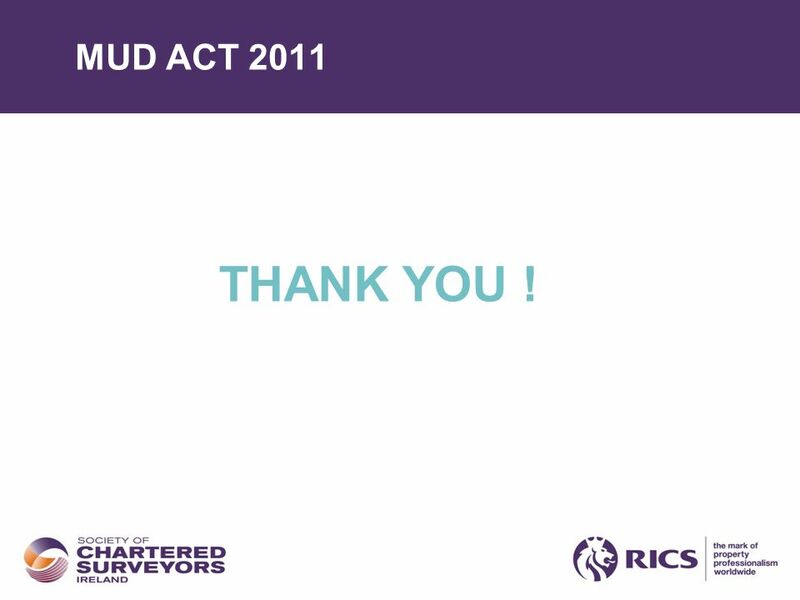 21 MUD ACT 2011 THANK YOU ! 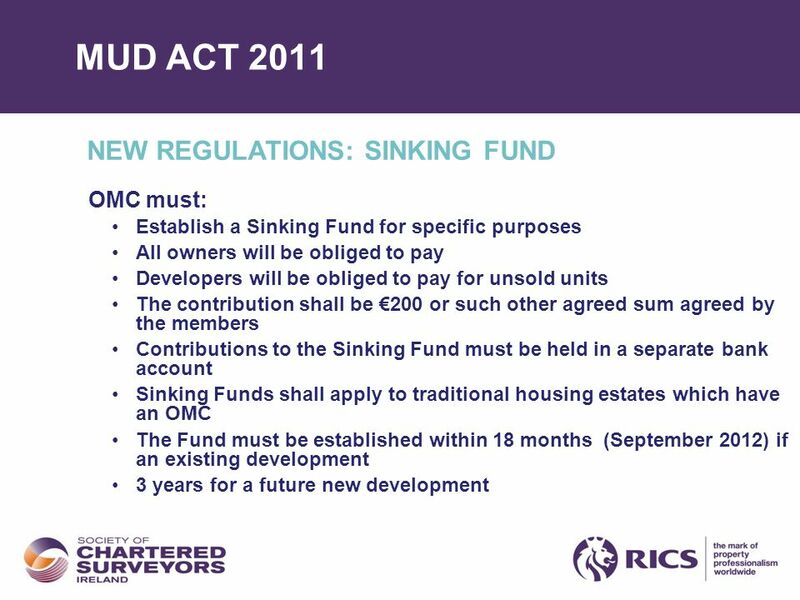 22 www.scsi.ie Society of Chartered Surveyors Ireland 38 Merrion Square, Dublin 2, Ireland Tel: + 353 (0)1 644 5500 Email: info@scsi.ie Dating back to 1895, the Society of Chartered Surveyors Ireland is the independent professional body for Chartered Surveyors working and practicing in Ireland. 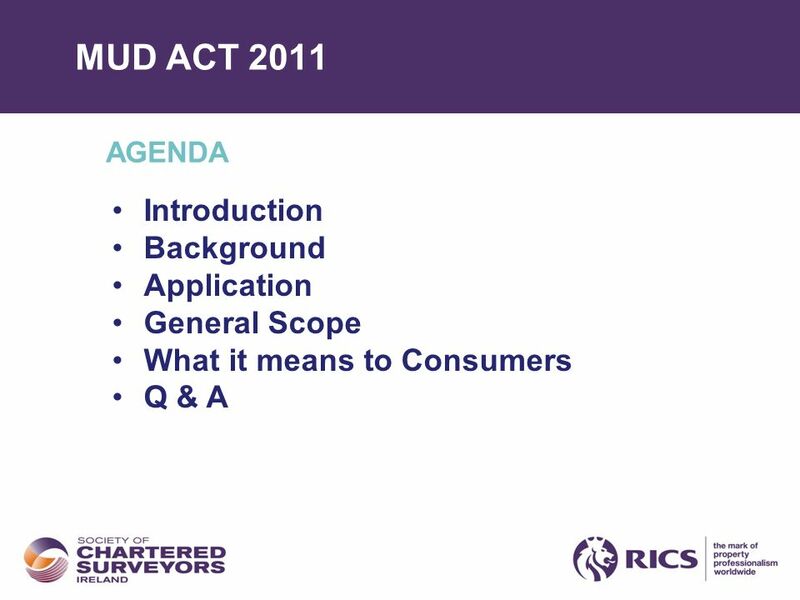 Working in partnership with RICS, the pre-eminent Chartered professional body for the construction, land and property sectors around the world, the Society and RICS act in the public interest: setting and maintaining the highest standards of competence and integrity among the profession; and providing impartial, authoritative advice on key issues for business, society and governments worldwide. 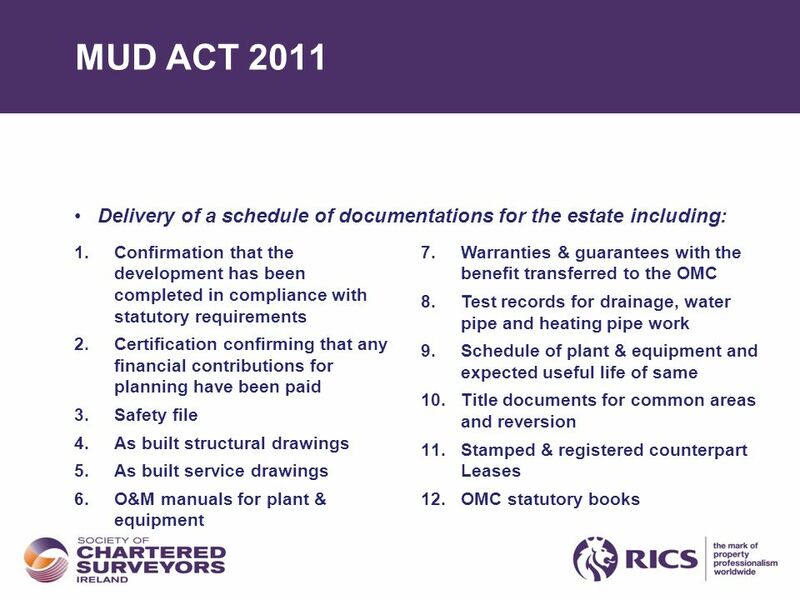 Advancing standards in construction, land and property, the Chartered Surveyor professional qualification is the worlds leading qualification when it comes to professional standards. 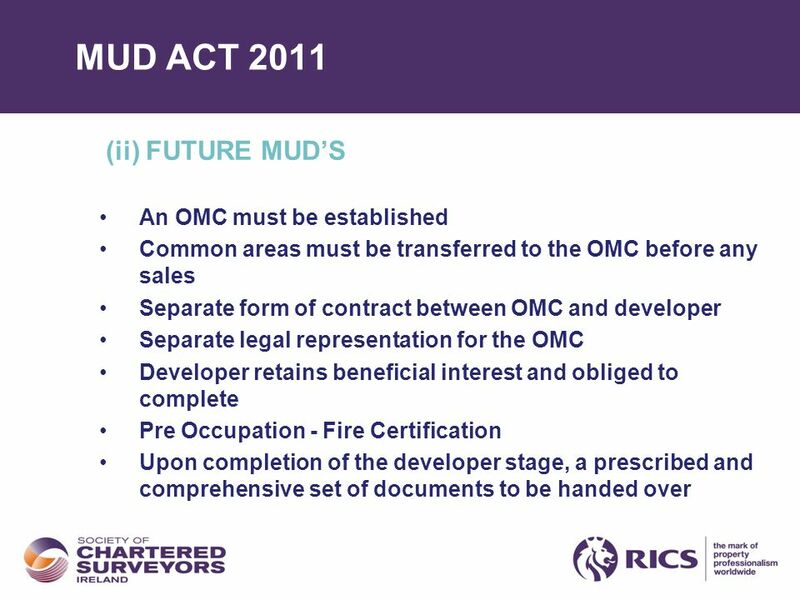 In a world where more and more people, governments, banks and commercial organisations demand greater certainty of professional standards and ethics, attaining the Chartered Surveyor qualification is the recognised mark of property professionalism. 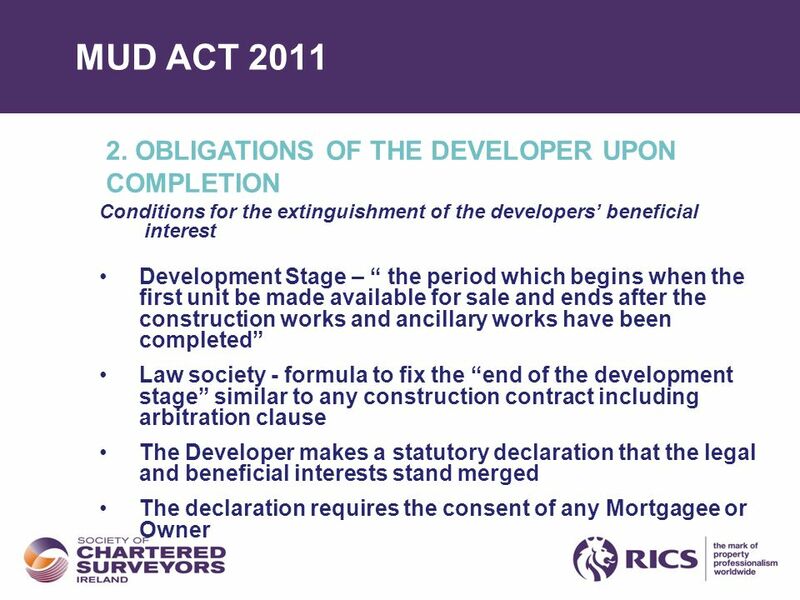 Members of the profession are typically employed in the construction, land and property markets through private practice, in central and local government, in state agencies, in academic institutions, in business organisations and in non-governmental organisations. 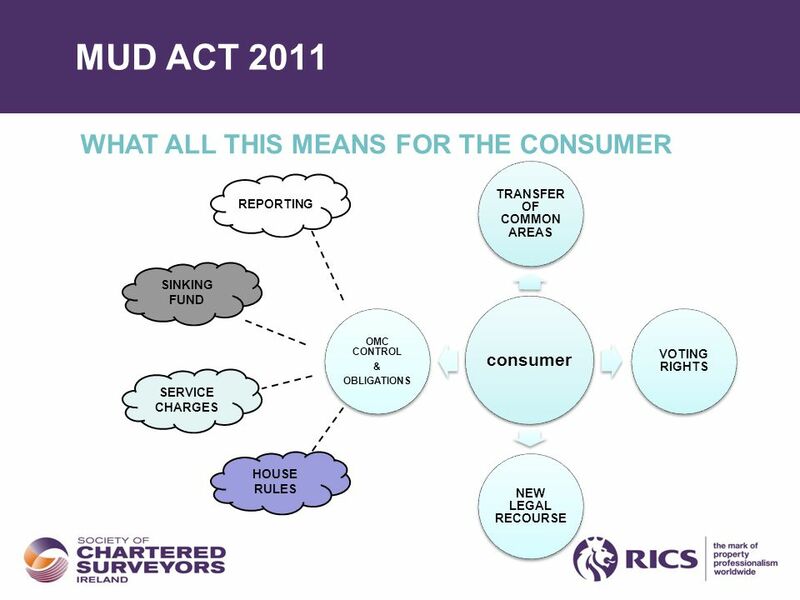 Members services are diverse and can include offering strategic advice on the economics, valuation, law, technology, finance and management in all aspects of the construction, land and property industry. 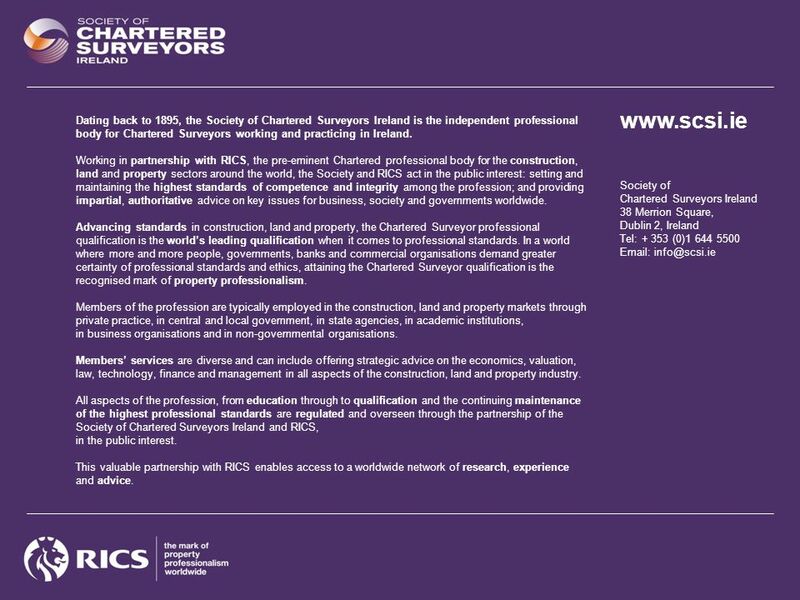 All aspects of the profession, from education through to qualification and the continuing maintenance of the highest professional standards are regulated and overseen through the partnership of the Society of Chartered Surveyors Ireland and RICS, in the public interest. 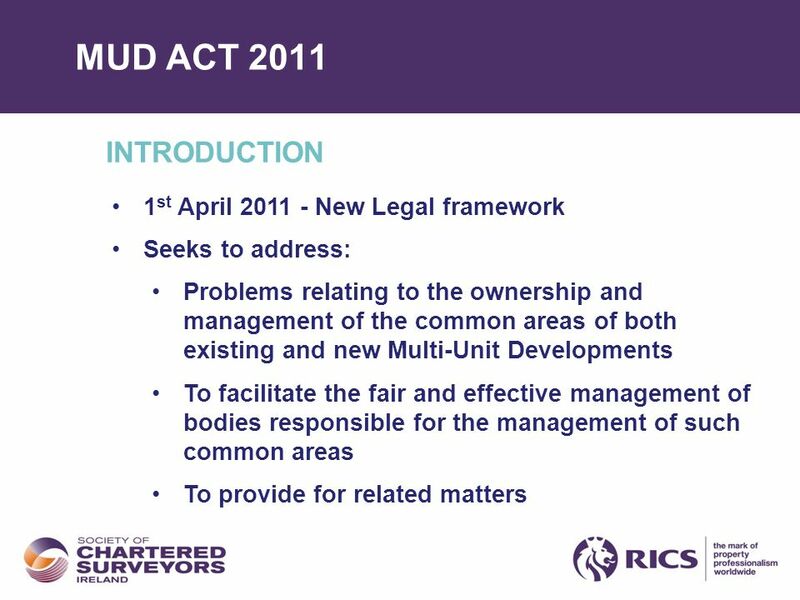 This valuable partnership with RICS enables access to a worldwide network of research, experience and advice. 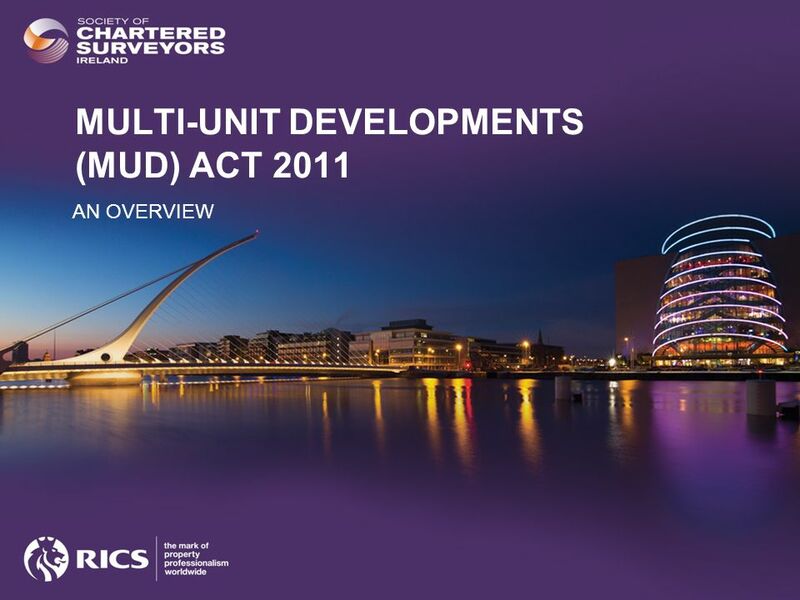 Download ppt "MULTI-UNIT DEVELOPMENTS (MUD) ACT 2011 AN OVERVIEW." 1 ITU Interconnection Workshop 17 August 2001 Role of the Regulator K S Wong Office of the Telecommunications Authority Hong Kong, China. 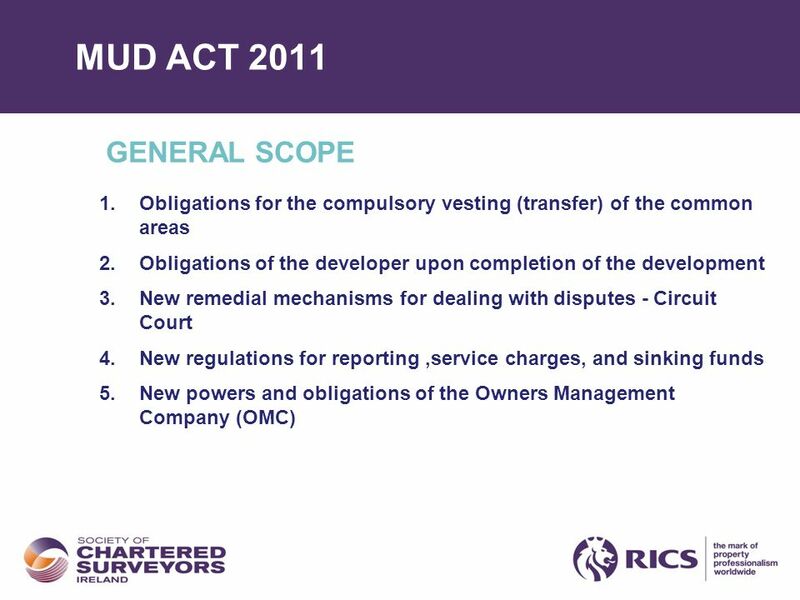 Contract Analysis Codex FutureLaw Stanford Law School. 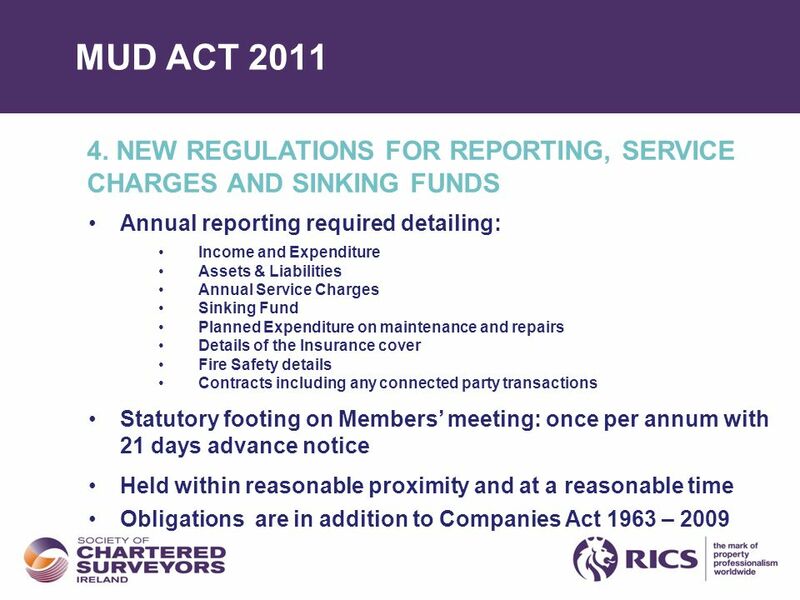 Using IFRS Based Financial Statements In Corporate Governance Gareth Davies Local Authority (Scotland) Accounts Advisory Committee secretary CIPFA Policy. 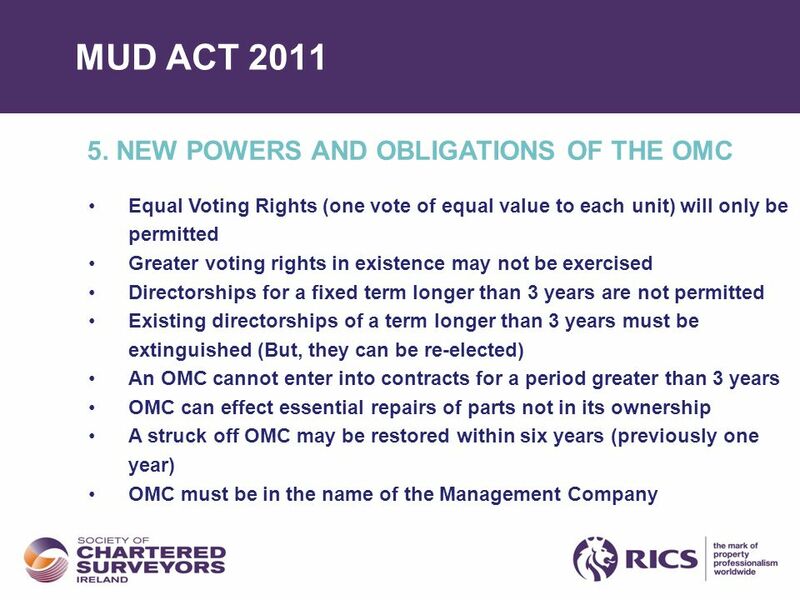 OFFICE OF MANAGEMENT AND ENTERPRISES SERVICES (OMES) PROCESS TO DISPOSE OF STATE OWNED REAL PROPERTY MELISSA MILBURN NOVEMBER 12, 2014. 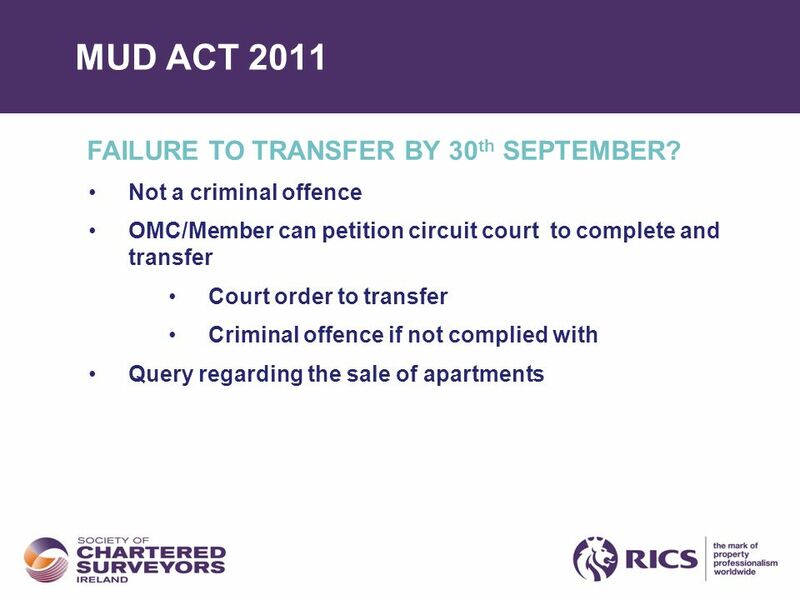 APARTMENT OWNERS NETWORK NOVEMBER o Outline the new District Court Procedure o o Service of Proceedings – Problems o Statute of Limitations – 6. 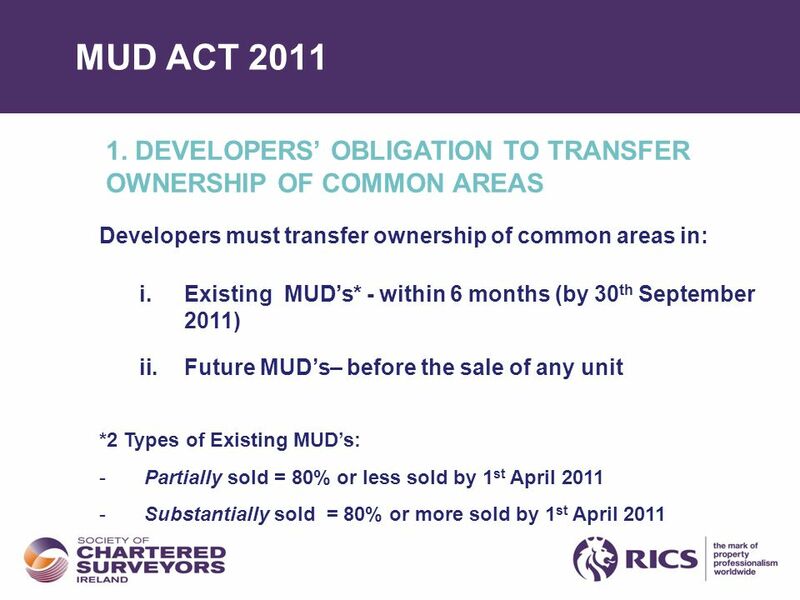 Commercial Leases: Hot Topics 29 April 2014. 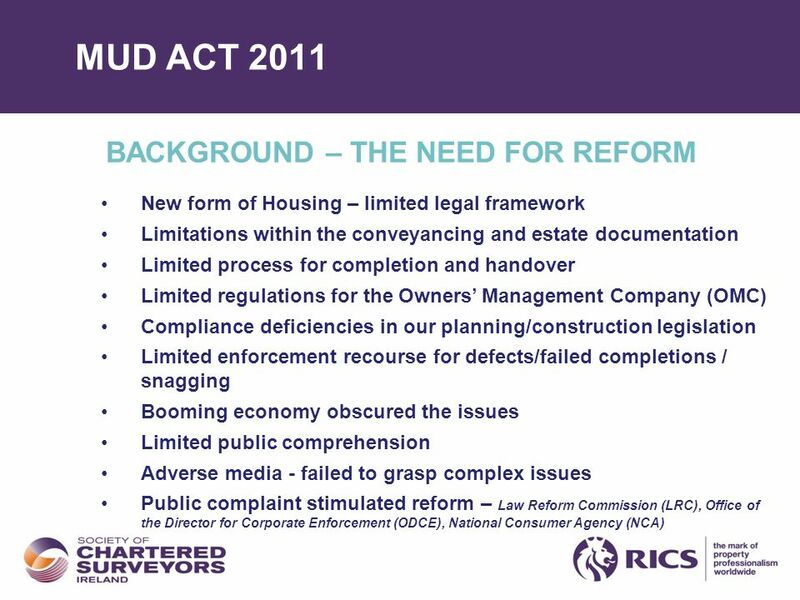 Major works RESIDENTIAL LEASEHOLD EXPERTS. 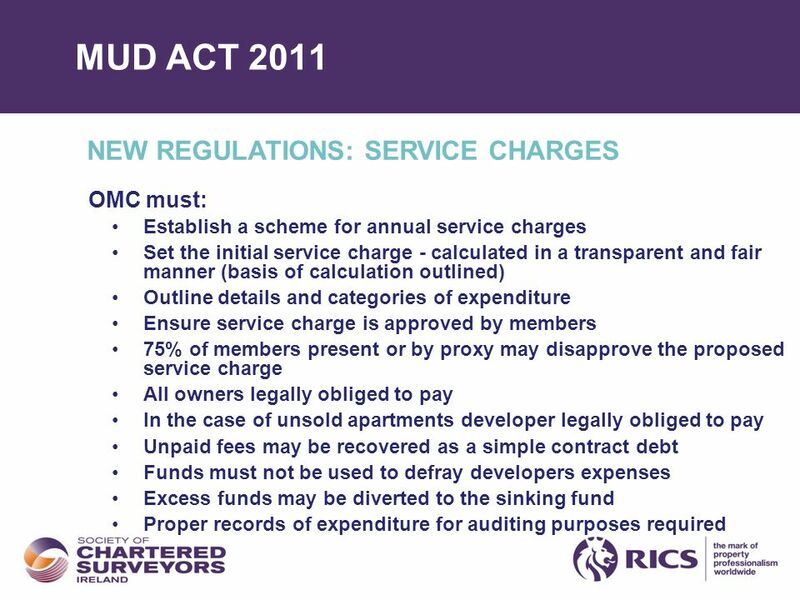 THE BASICS Your Landlord has a duty to you and all Leaseholders in the property, to properly and continually. 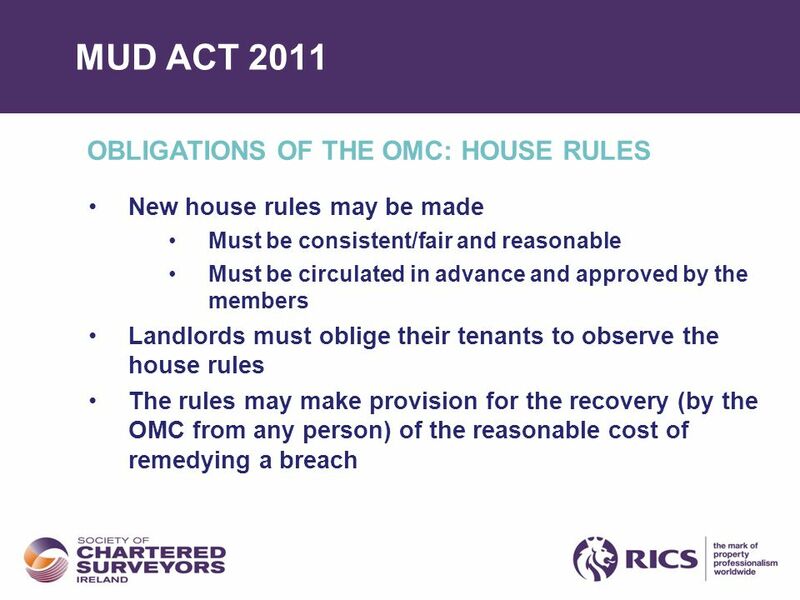 Regulation of the Private Rented Sector in Northern Ireland Avril Hiles Housing Division 15 November 2012. 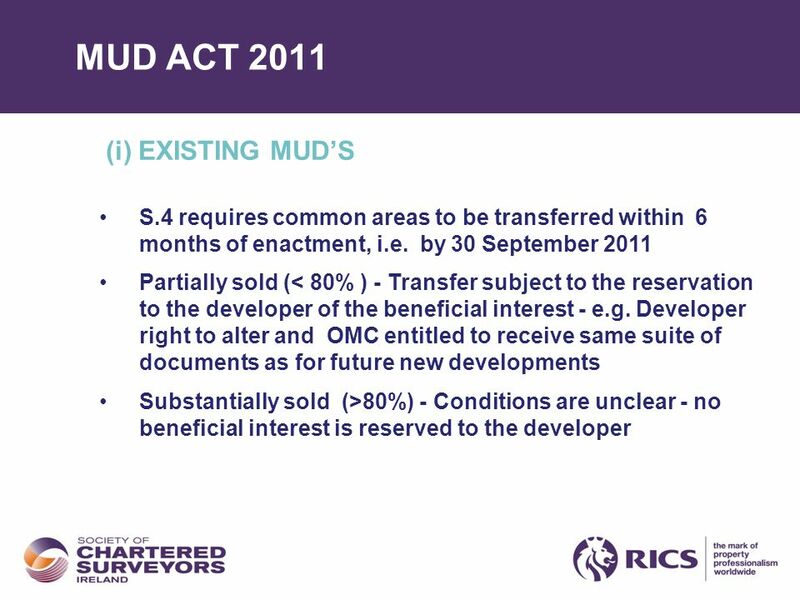 Presenter Bruce Bentley Partner, JS Mueller & Co.
Nigel Hales 24 July 2014 Miller Harris in Business. Unified Carrier Registration (UCR) Update August 24, 2006. 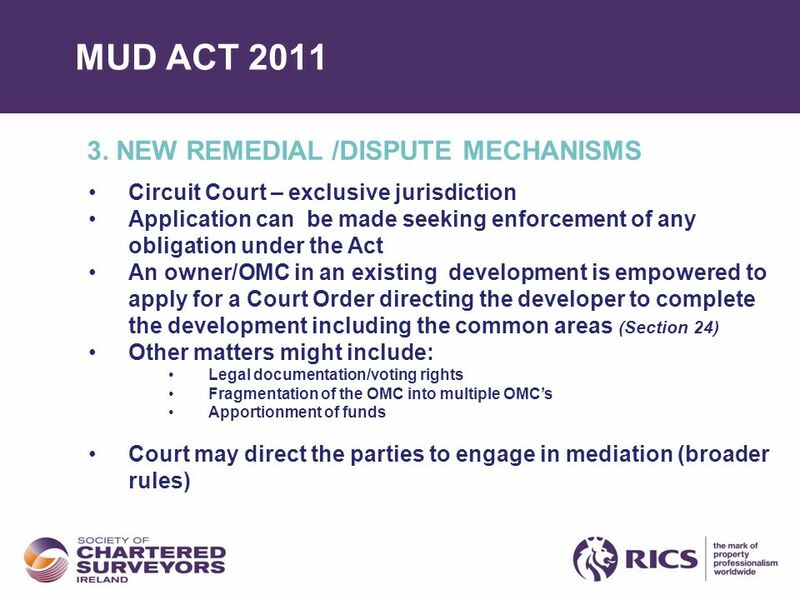 APARTMENT OWNERS NETWORK NOVEMBER 2014. o Outline the new District Court Procedure o o Service of Proceedings – Problems o Statute of Limitations – 6.